For those families wishing to plan their own memorial voyage, Sea Services provides the vessel and crew, from the port of your choice. You select the time, place and arrangements and invite as many guests as you wish. We have many of crafts at your service. And we can help you plan every detail of this special memorial. As your voyage will be a first-time maritime funeral experience for many of your guests, Sea Services will work closely with you to make this a fitting memorial occasion, carefully evaluating your needs and desires to insure a safe, comfortable and memorable day for all. Whether your group is large or small, from one guest to several hundred, Sea Services' carefully chosen captains and crews have the licensing and experience to provide a safe, and most memorable trip. Most often, cremated remains are received at Sea Services' home office via priority mail express US Mail, sometimes directly from the funeral home or crematory. For the specific "Three Easy Steps" to a Captain's Service™. Call us anytime with your specific wishes, or just to discuss our services. Sea Services will work hard to accommodate your desires while insuring the best value. 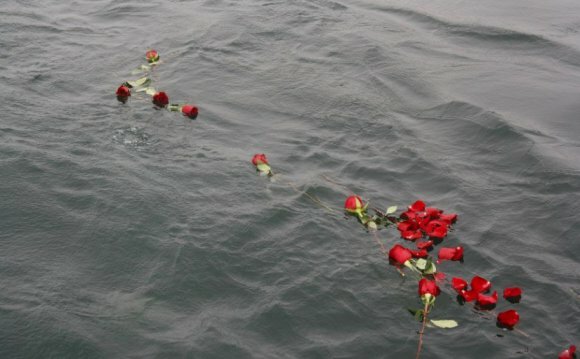 The scattering of cremated remains on the sea's surface is timeless tradition - a chosen funeral custom for thousands of years. Many, however, due to personal, religious or traditional desires, prefer to be placed in a burial urn on the ocean's floor.